“Three Sisters” refers to the three main crops of Native Americans: beans, corn and squash. The crops are planted close together and in this way benefit from one another. Corn stalks provide the structure for beans to climb, beans provide nitrogen to the soil that other plants need, and the squash spreads along the ground blocking the sunlight and in so doing, helps prevent weeds. Now that you’ve had your agricultural lesson for the day, consider this popular southwestern soup recipe. I often add Italian sausage to this for additional heartiness, but the recipe also converts easily to vegetarian and to crock pot cooking. In a 4 quart (or larger) crock pot, add butter, onion, garlic, chicken broth and celery. Cover and cook on LOW for 2 hours. Add carrots, squash, tomato and potato and cook 1 1/2 more hours; vegetables should be mostly tender. Add undrained canned beans, corn, tomato paste, oregano, salt, and black and red pepper flakes. 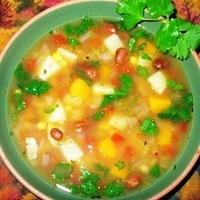 Turn cooker to HIGH and cook 15 or more minutes or til vegetables are tender and soup hot. Serve with optional cilantro garnish/topping. This is a wonderful, healthy & very attractive (even festive) dish! Wouldn't change a thing. Thanks, SF! This is a beautiful looking soup, SF! I too am happy to see the slow cooker option...since I just bought a new one and am trying to use it for everything I can lol! Oh my, this was soooooo good. I used as much as I could from my garden. Instead of plain oregano I used a Mexican spice blend. And instead of crushed red pepper, I picked a fresh red jalapeno to slit open and let sit in the hot soup until serving. What a wonderful array of flavors; the butternut gave it an awesome taste. Years ago I'd used zucchini but you really need a hearty winter squash. My fresh, hot homemade Honey Oat Bread was the perfect compliment. I'll be making this again now that I've re aquainted myself with the recipe. This tasted wonderful; I loved both the varied healthy ingredients and also the varied vibrant colors. If possible and you have it available, a homemade bread is an awesome compliment to this healthy, tasty soup. This looks good. I like to try it. Thanks for your review, Amy, and I appreciated your seasoning ideas. How about posting your homemade Honey Oat Bread recipe? What a hearty soup, and I love the crock pot option! looks yummy and easy! love the slow cooker option.